Boko Haram leader Abubakar Shekau in a new video published online on Thursday has debunked the claim that he was injured in an airstrike in remote northeast Nigeria. The terrorist leader who was said to have been wounded and one of his deputies killed when two air force jets bombarded fighters at Balla village last Friday said he is alive and ignorant of the airstrike attack, insisting he was not injured and that none of his key lieutenants was harmed either. In the 14-minute video which he spoke in Hausa and Arabic , Shekau was flanked by two masked, armed men, sitting against what appeared to be a desert camouflage net and Boko Haram’s black and white insignia with no indication of where the video was shot. “I’m alive, I’m alive, I’m alive,” he said, wearing his trademark camouflage jacket and cradling an assault rifle. “I’m alive; you have not killed any of my men. I didn’t even know this incident you are talking about ever happened. “What surprises me is your claim that I’m nursing wounds. Look at me well. Look at my sitting posture.” Shekau said. There was a surveillance footage which showed air force missiles being fired on Boko Haram fighters believing to have injured or killed them according to the army spokesman. “There were indications that quite a number of the terrorists’ key leaders have either been killed or wounded,” army spokesman Brigadier-General Sani Usman said earlier Thursday, without naming Shekau. 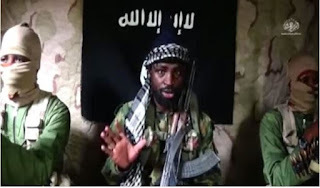 Recall a source with links to the Islamist militants told AFP on Wednesday that Shekau narrowly escaped death when the second missile hit as he was on his way to preach at Friday prayers. “It’s bloody propaganda,” he said of Shekau’s video denial. “Shekau hurt his back from the impact of the second strike. He was injured in the back and then taken out of the area to a place around Kolofata (near the Cameroon border),” he added. The Boko Haram insurgency has left at least 20,000 people dead and made more than 2.6 million others homeless since 2009, devastating the region and leaving millions dependent on humanitarian aid.